Do you have a 2.5 year old who loves to twirl, hop and clap? We had so many parent requests for a class for their not quite three year olds that we decided to create a special class just for them. Registration will open about 5 weeks before each session. Tuition is $140 for 12 weeks of classes. Complete uniform (skirted leotard, tights, shoes) can be added for $40. Pieces are also available individually. Purchase online during registration or directly at our studio. Unlimited make-up classes within the same session. Our classes often fill up and bringing in a trial student is not fair to the students who are already enrolled and have gotten used to each others and the class structure. Please register and then, if it turns out that the class is not a good fit for your child, take advantage of our Risk-Free New Student Guarantee (see below). Risk-Free New Student Guarantee: If you decide the class isn't a good fit, you can request a refund for the remainder of the session up through the third week of the session. Boys: Black leggings or shorts, white t-shirt, black leather ballet slippers. For boys, black slippers are included in the class fee. Please do not purchase ballet shoes at any of the big box stores. They are not leather and do not fit well. Contact us to get fitted for dancewear at Ballet U.
Click on the Register button to get to our registration page. Choose the correct season "Winter2018 - Ages 2.5, 3, 4"and then your preferred class time from the schedule. If the class title appears in red, it means the class is full. About your child's teacher: The majority of our children's classes are taught by Ms. Stephanie, who is a patient mother of four, a creative and experienced dance instructor and loves passing on her love of dance to children. Class sizes are kept small and manageable with the help of our preteen and teen class assistants. 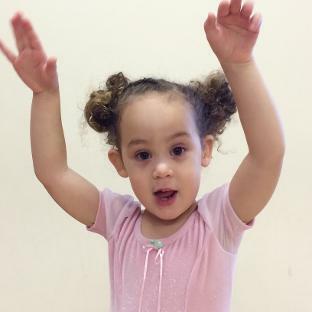 If your child is at least 30 months old and independent enough to be happy without mom or dad in a classroom setting for a limited period of time, he or she is likely ready and would greatly enjoy our Tiny Dancers class. Children do not need to be potty trained for the Tiny Dancers class.